In my twenties, I spent five years in Upstate New York. During those years, one of my favorite restaurants is a family own Vietnamese restaurant in the college town simply named Vietnam Restaurant. It’s not the cheapest place, there’s always “Chinese” restaurant for that, but the food is simply marvelous. 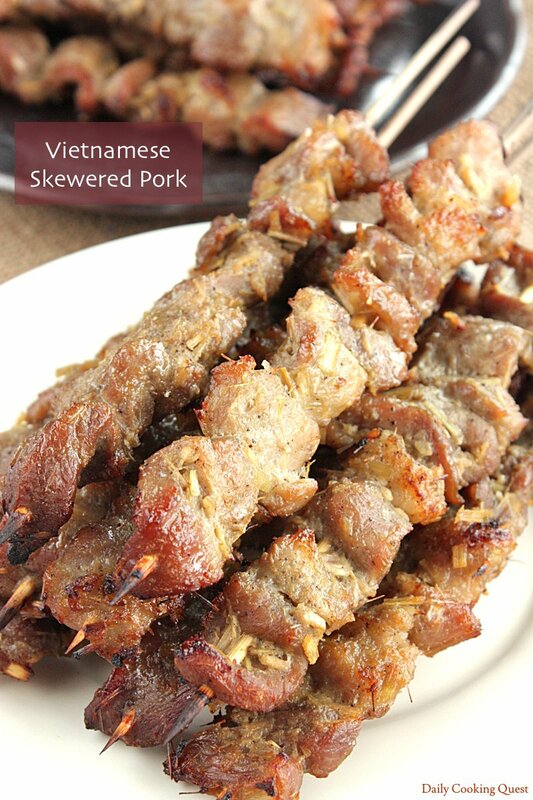 My favorite among the menu is vermicelli bowl, especially the ones that come with this Vietnamese skewered pork. 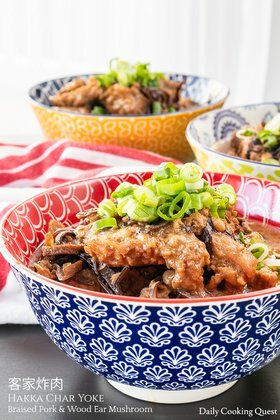 As it turns out, it is super easy to recreate this dish at home! Let’s not kid ourselves here. The best way to make these babies is by charcoal grilling. But since it’s winter, and it’s crazy cold (-20 Celsius cold! ), I make this in my oven instead. If you have a grill pan, you can cook these on stove top too. I’ll just assume you are willing to entertain me and you are going to use your oven, yes? But if you want to go ahead and do the charcoal grilling thing, feel free to do so. 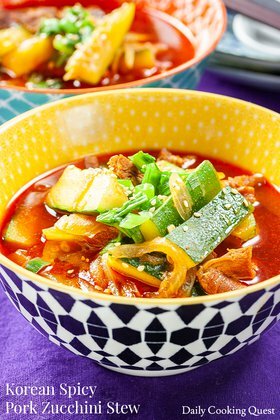 This recipe is so stupid simple, I don’t think anyone can botch it. Just need to marinate the thinly sliced pork for at least 2 hours, then thread into bamboo skewers, and cook with your preferred cooking method. Though it is possible to get good result with only 2 hours of marinating, I highly suggest sticking the whole thing in the fridge overnight. Your patience will be rewarded. Also, it is almost a guarantee that there will be leftover marinating sauce once you thread all the pork with the bamboo skewers. Those are really good as basting sauce, so don’t throw it away. 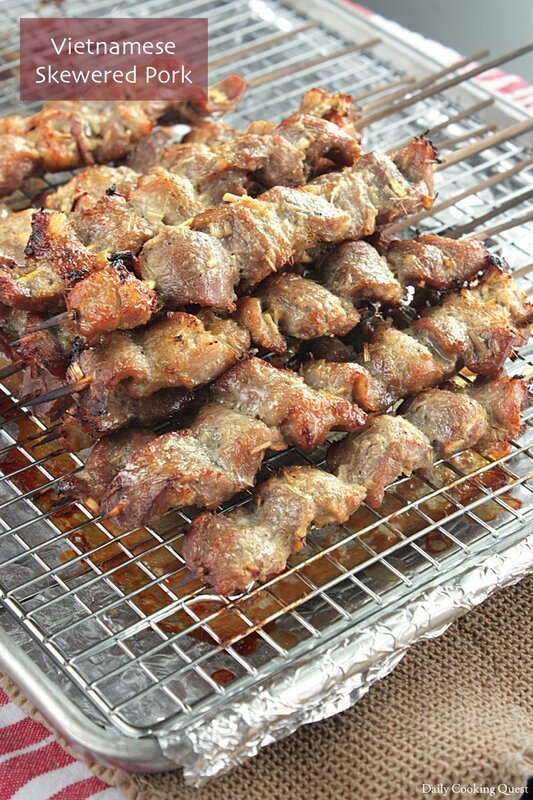 Mix together pork with the rest of the ingredients (except bamboo skewers), and marinate for at least 2 hours, preferably overnight. Bake in preheated oven for 15 minutes, then flip to the other side, brush with any leftover marinating sauce, and bake again for another 15 minutes. Turn off oven, but turn on broiler. Broil each side for 1-2 minutes until charred. Serve hot. (*) Store bought. Or homemade version: heat 3 tablespoon sugar in a heavy bottom sauce pot until melted and amber color, then quickly add 1/2 cup hot water to the pot. Stir until fully dissolved. Hi Anita, Thanks! 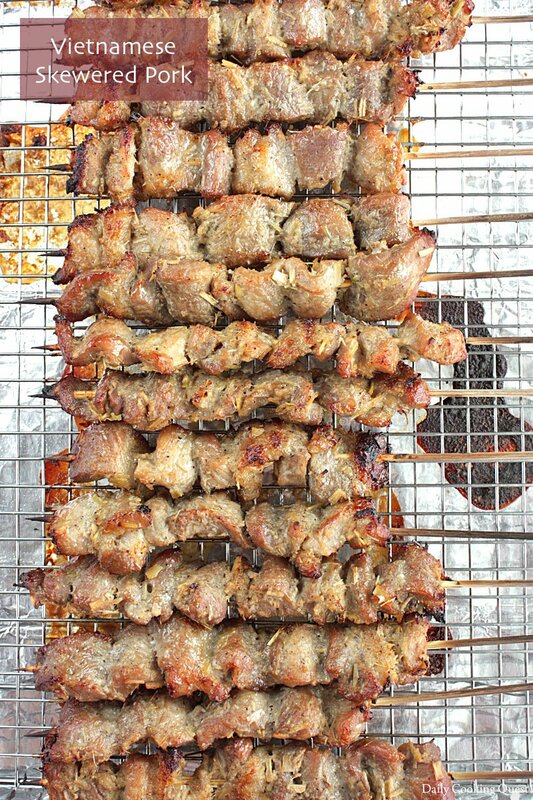 This Vietnamese skewered pork would make a good topping for a salad or a bowl of pho. How long can the cooked pork keep in the freezer? I can take it out of the freezer to microwave and make a quick dinner. Also, can I use Indonesian sweet soy sauce (kecap manis) rather than making the Vietnamese caramel sauce from scratch? Thanks again. Hi Claudia, it should keep for a while if you freeze it, I would say a couple of weeks at the very least. 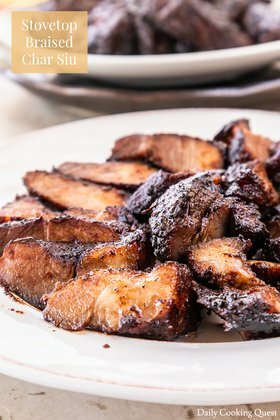 You can use kecap manis if you want, but they will have a darker color and most likely much easier to char during baking. Wow! What a yummy and delicious recipes, my mouth is already watering and i can't wait to try this at home asap.